Normally you want to make animations using storyboards and then some code behind to start the animations. In this post I’ll show you a way to implement the animation in a very clean and MVVM way on a very simple application. In the following sections I’ll detail how to use enums to switch between the states. 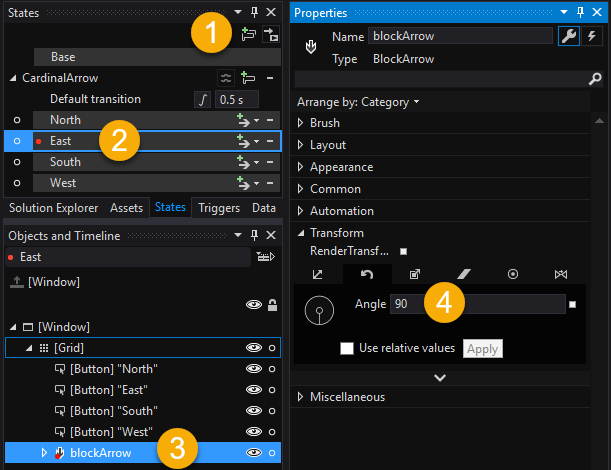 First, you create the states for each cardinal point, then you select one of the states and the blockArrow from Objects and Timeline, then go to Properties and change the Angle for that state. Repeat for all states. Check the screenshot below for more details. 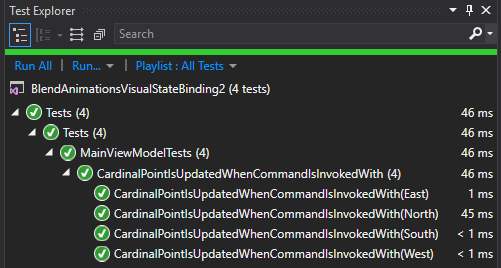 Whenever the CardinalPoint property will change, the PropertyChangeTrigger will, well, trigger and will execute the GoToStateAction that will start the animation corresponding to the state provided. Here we can use a binding to the CardinalPoint property (which is an enum), BUT we just need to be careful so the animation states have exactly the same names as the enum. This approach seems quite good because we can control the animations using just some bindings to an enum which makes it very clean and easy to test. There is no extra code behind for handling the animations, just pure bindings to enums and using commands and blend behaviors. Of course, there could be more to test, for example: do the animations actually work? The property is set, but is the binding correctly done in the view? For that you’d have to rely on visual/manual testing… or you could spend some effort on trying to automate that… but I’m not sure if this has a good return on investment… The visual part is the easiest to identify when something is broken - it pops right into your eyes. Anyway, this is for you to decide on a case by case basis… At least the most important stuff: the view model is tested! Hopefully this will help you in replicating the behavior I demoed here. To make it easier I published the full source code on GitHub so you can run it on your own computer.